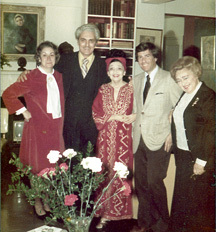 The author's father with family and friends. Many of us have been longing for an in-depth and authoritative biography of the great Clara Rockmore. Our friends at ThereminVox.com published in March of this year an extensive essay of her life and final years. Which may help tide us over till a full book comes out. Steve J. Sherman is Clara Rockmore's great-nephew and Nadia Reisenberg's grandson (his father Bob Sherman is Nadia's younger son), and a photographer in the musical performing arts (www.stevejsherman.com). Clara was a very proud and dignified person, who cherished love, integrity, honesty, decency, trust and loyalty. She was a hopeless romantic, a happy and spirited woman who delighted in chivalry. She abhorred vulgarity, although was not afraid of it. She had a sharp and highly refined sense of humor, and she was as feisty as she was charming – the life of every party. Clara was petite, and beautiful, and had many admirers. A natural performer, she was a diva who never let you forget it. Well versed in art, literature, languages, politics and of course, music, she had a strong will and was as determined as she was open to alternative. She defied many of her generation by readily accepting and embracing eccentric or alternative lifestyles in others, as long as they were true and honored themselves and those around them. It has definitely helped to fill a significant historical gap. After the first page which mainly deals with the author's motivations for his writing, are six incredibly rich pages giving an overview of her early life, then much about her later years in fascinating detail, then a page on events that may, or not, interest some in our community, and ending with a touching recount of Clara's final days. Many thanks to the author and to ThereminVox.com for publishing this piece, also Liz Palin for pointing it out to us. An excerpt from the Wikipedia entry is also available on our Clara page.